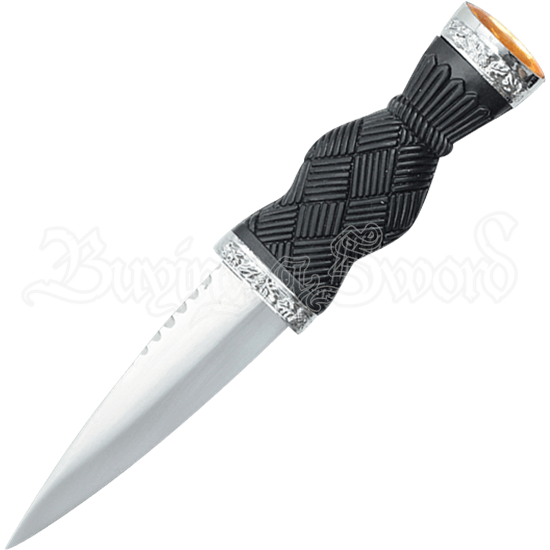 An iconic piece of any Scotsmans ensemble, the Yellow Gem Cross-Hatch Sgian Dubh is modeled after the traditional dirk used by Highlanders in eras past. Silvery Scottish thistle patterns and a yellow gemstone detail the replica knife. Made of stainless steel, the spear point blade of the knife features slight serration along its back and up near the hilt. This black composite hilt sports cross hatch ridges throughout, creating a unique grip, and silver tone bands decorated with a thistle leaf pattern frame the bottom and top edges. Inset within the bottom band is an oval shaped, multi-faceted gemstone in a yellow hue, making up the distinctive flat pommel shape. A must-have addition to Highlander reenactment looks and historic weapons collections, this regal looking Scottish dirk comes with a matching composite sheath.